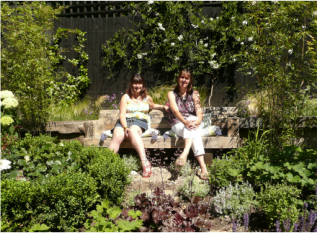 We are two North London based professionals with a passion for plants who got together in 2006 to form Planting Gems. Our mutual interest in design, colour and texture influences our schemes and together we can create a garden to suit any style, whether you are looking for a contemporary, minimalist scheme, a traditional cottage garden or a flamboyant colourful border. Anne, born in the Loire Valley, brings some French flavour to the team. With a professional background in Marketing, she re-trained and qualified as as a Horticulturalist and Garden Designer at Capel Manor College in 2003. Caroline is a Barrister who re-trained as a Horticulturalist and Plantswoman at The English Gardening School in 2004. We both like to get our hands dirty and do most of the soft landscaping work ourselves. We can also recommend and work with contractors for hard landscaping, fencing, turfing and tree work.